I bought some celery starts at the local garden center this spring, even though I didn’t think celery would grow here on the wet side of the Cascades. Celery needs a long growing season, 5 months, and cool weather. We have the 5 months (May through September), but generally not cool summers. Celery gets tough and stringy in the heat. But this has been an unusually cool summer. We had a cold, wet, miserable June. Only one sunny day. And this followed a cold, wet, miserable May. Summer was a full month late. So, the celery was happy. I have done everything else wrong with my celery. It is supposed to be grown in a trench, like leeks, in order to hill up the soil around the plants so that they are blanched. It should be planted 12 inches apart, in rows 2 1/2 feet apart. It should be fertilized regularly with a high nitrogen fertilizer. 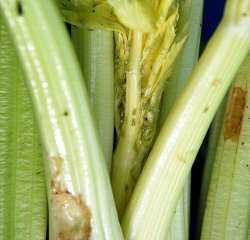 Commercial growers spray the wits out of it because bugs love celery. 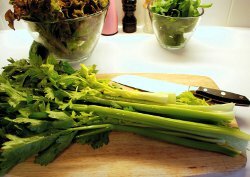 (Celery is one of the top 12 vegetables for heavy pesticide residue. See this article.) Well, alas, I have done none of that. The soil was amended with Steve Solomon’s fertilizer at planting. But the plants are too close together, the slugs are invading, and now…aphids. 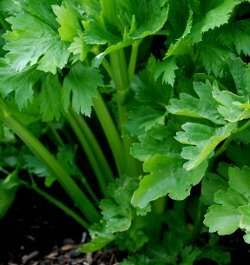 Celery belongs to the same botanical family (Aepiacea or Umbelliferae) as angelica, anise, arracacha, asafoetida, caraway, carrot, celery, centella asiatica, chervil, cicely, coriander/cilantro, cumin, dill, fennel, hemlock, lovage, Queen Anne’s Lace, parsley, parsnip and sea holly. No wonder that photo I took of an old flat leaf parsley plant looked like young celery. The bugs and slugs apparently can tell these plants apart; slugs and aphids have never attacked my parsley. The question now is: how to use the celery in the kitchen. Soups, sauces and celery sticks come to mind. The French mirepoix flavor base of onions, carrots and celery, the Italian soffritto, and the Cajun and Creole Holy Trinity are cooking staples using celery. The history of celery goes all the way back to the tomb of pharaoh Tutankhamun (died 1323 BC). But it was the ancient Greeks who really invested cultural significance to celery; they associated it with the cult of death. Death to the aphids, I hope. Read the Wikipedia article on celery – it’s quite interesting. 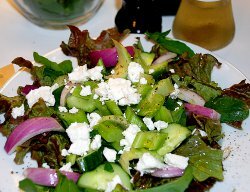 Here’s a simple salad with young garden celery. This homegrown celery is very sweet and mild, not at all stringy. The leaves are so abundant and delicious, I will have to think of something to do with them. At least the leaves are not ruined by the bugs and slugs. I’d better go search the garden shed for some organic pesticide before my entire crop is destroyed. tomatoes, if you have them. I have no ripe tomatoes yet! 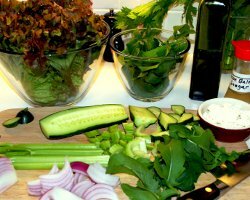 Layer salad in a salad bowl, starting with lettuce. Add on the arugula leaves, then celery, onion and cucumber. Drizzle with vingegar and olive oil. Sprinkle on cheese. Grind on some black pepper and serve. Hi Tanith. I never did get rid of the aphids. I tried shooting them with the hose water, but they came right back. 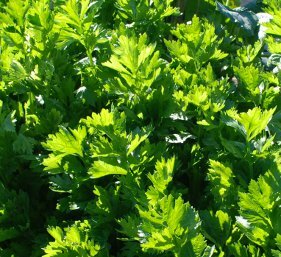 I have given up on celery, and now plant parcel, which looks like a larger thicker parsley, but tastes like celery. Good for seasoning, very easy to grow and no bugs! I’m trying to simplify the garden, so bye bye celery. There may be organic bug sprays that would work. Hey there! 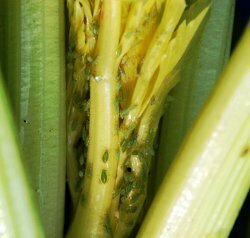 So I’ve recently planted a left over celery, and it was doing quite well, until we noticed there’s an army of what seems to be black aphids at the center of my stalk.. Did you ever find out how to get rid of them?? Your help would be much appreciated!